LAKEWOOD, Colo. – Despite a career and season-high 19-points by Dez Stoudamire, the Black Hills State University men's basketball team dropped its third straight contest, 85-80, to Colorado Christian on Saturday night. The Yellow Jackets fall to 4-4 on the season and 1-3 in conference play, while the Cougars improve to 2-8 on the season and 1-3 in conference. In the first half, BHSU jumped out to a quick 3-0 lead with Connor O'Hearn knocking a three down within the first 30 seconds of the game. However, the Cougars answered back with a jumper to trail, 3-2. From there, the Green and Gold continued to increase their lead, as they led by six at 12-6 by the first media timeout. Colorado Christian grabbed the lead from the Yellow Jackets with 12:33 remaining in the first, leading 18-14. However, Black Hills State tied the game at 18-all a minute later. From there, the two teams traded off the lead until 20-all. Fraser Malcolm hit a shot from the top of the key to give the lead back to BHSU. Malcolm's shot started an 11-0 run for the Green and Gold, as they grabbed an 11-point lead at 31-20 with 4:34 remaining in the half. The Cougars tried cutting in on the lead, but the Yellow Jackets held on to close out the half, 40-34. After halftime, Stefan Desnica hit a jumper to give the Yellow Jackets an eight-point lead, 42-34. However, the Cougars cut in on the lead, and tied it up at 48-all with 13:49 left in the game. From there, the two teams kept trading off points and the lead until 12:39 remaining in the game. The Cougars grabbed the lead by one at 55-54, and managed to hold onto it until 64-all. The Yellow Jackets come within one point, with Antonio Capley and O'Hearn knocking in five points to bring it to 62-61. Tyler Murrell of the Cougars hit a layup to go back up to 64-61 until Makaleb McInnis knocked one in from downtown to tie the game. However, the Cougars grabbed the lead back and increased it to 12 at 80-68 with a minute remaining in the game. The Yellow Jackets tried to rally back but fell short, 85-80. Stoudamire led the way, scoring a season- and career-high 19 points, while Malcolm scored 15 points, and O'Hearn had a season-high 12 points. The Green and Gold shot 44.6 percent from the field and 88.2 percent from the line. Desnica grabbed a career- and team-high 11 rebounds. The Yellow Jackets grabbed 32 total rebounds. 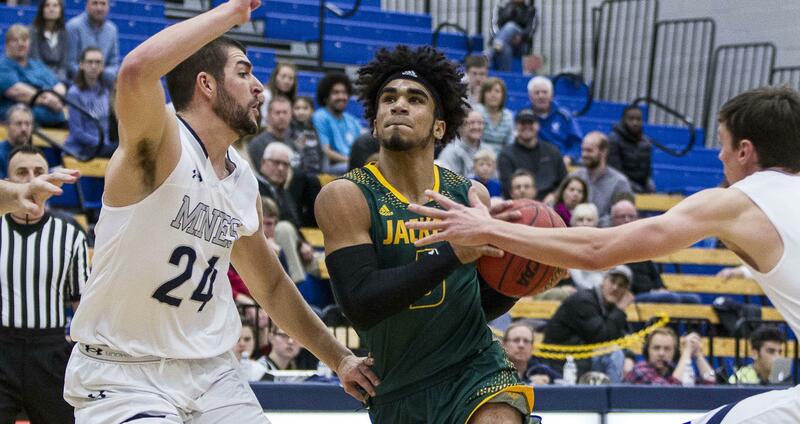 Black Hills State returns home to complete a three-game home stand to end the calendar year, starting with Regis University and Chadron State on Friday, December 15 and Saturday, December 16. Tipoff is slated for 7:30 p.m. on Friday and 6 p.m. on Saturday. Meanwhile, Despite a 19-point effort by Rachel Erickson, the Black Hills State University women's basketball team dropped its second game of the season to Colorado Christian University on Saturday night, 74-68. The Yellow Jackets fall to 2-2 in the Rocky Mountain Athletic Conference and 8-2 overall, while the Cougars claim their first RMAC win to improve to 1-3 and 3-6 on the season. The Yellow Jackets got off to a slow start, as the Cougars took a 10-0 lead in the first quarter. Remi Wientjes ended the CCU run knocking down a three-pointer followed by Keely Bertram hitting a jumper at the top of the key to bring the Green and Gold within five. Towards the end of the first quarter, Colorado Christian increased its lead up to 12 with 36 seconds remaining until a foul put Cortez Standing Bear at the line. Standing Bear knocked down both free throws to bring the Yellow Jackets within 10 to trail, 22-12. Within the first two and a half minutes of the second quarter, BHSU cut into the Cougar lead to trail by six at 23-17. However, CCU was not giving up easily though, as they ran the lead back up to 10 at 29-19. In the final minute and half of the second quarter, Alyssia Martinez hit a layup under the net to bring the Green and Gold within five at 33-28. The Cougars grabbed the last shot of the half to lead by seven, 35-28. After halftime, the Yellow Jackets came out hot grabbing their first lead of the game. Julia Seamans started the 8-0 run for the Green and Gold hitting a shot from downtown followed by Erickson draining one in from beyond the arc. Katie Messler hit the last shot of the run to give BHSU a one-point lead at 36-35. From there, the Green and Gold managed to get up to a five-point lead at 45-40, but were unable to hold onto it, as the Cougars closed out the third quarter with a 51-50 lead. In the fourth quarter, Black Hills State tried to rally back in the final two minutes of the game, as they came within three points off a Bertram three-pointer. However, within the final 40 seconds, the Yellow Jackets managed to grab two steals and capitalize on it, as Bertram and Erickson each scored. It was not enough though, as Colorado Christian was able to grab the win and defeat BHSU, 74-68. Erickson finished with 19 points going 41.2 percent (7-of-17) from the field and 57.1 percent (4-of-7) from the line. Seamans scored 14 points while Bertram had 11. On defense, Messler grabbed a team-high 10 rebounds. The Yellow Jackets slipped just past the Cougars on rebounds, 35-34. Black Hills State returns back home for their final three games of the year before returning to action in 2018 hosting Regis University and Chadron State on Friday, December 15 and Saturday, December 16. Tip off is slated for 5:30 p.m. on Friday and 4 p.m. on Saturday.